Our civil ceremony musicians regularly perform at licensed stately homes, hotels, famous landmarks, football grounds and registry offices. 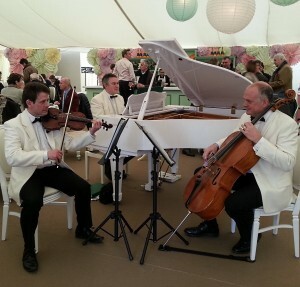 We recommend a group of 3 or 4 classical musicians for weddings numbering up to 130 guests, providing ambience without overpowering conversations. 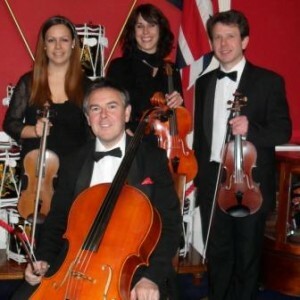 You may like to consider our String Quartet or Palm Court Trio. Both provide an excellent range of repertoire suitable for a wide range of ages. * As guests arrive, encouraging the taking of seats in plenty of time. * Processional music for the entrance of the bride. * The signing of the register and ceremony photographs. * Recessional music for the departure of the happily wedded couple. Our guide to wedding music will assist you with your choice of repertoire, however please call or email any time should you have a special piece in mind. The only rule to follow is that a civil ceremony must not include hymns, religious readings or prayers. Again we can advise you on this if unsure. If you plan to have a drinks reception following on from the ceremony, using the same musicians performing a different and more relaxed repertoire, will provide you with a cost effective way of continuing the musical accompaniment. Most venues require visiting musicians to have adequate public liability insurance with electrical equipment PAT certified. Kaleidoscope will provide you with the necessary documentation. Useful tip: Think musically as well as visually! Whilst a harpist may look splendid playing away in the corner of a large room, with a 50 or more guests chatting to each other will the music be heard?